We DO NOT offer a brochure of house designs, because . . . . .
We manufacture prefabricated houses to YOUR design, NOT ours. Leaving you with 100% design flexibility. If you already have your own design plans, (.dwg files / AutoCAD's) then our experienced team of engineers, using an advanced software design program, can transpose them into plans for a Steel-Frame prefabricated home for you. Whatever those house designs or projects maybe. 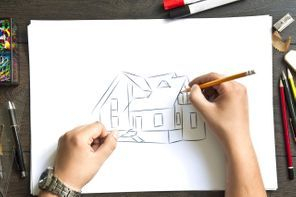 Houses, developments, semi-detached homes, commercial units, link houses, social housing projects, chalets, lodges, apartment blocks, motels and prefabricated hotels . . . .
'FREE APPRAISALS and ASSESSMENT' are available for your existing designs. If you are not that far advanced, we'd be equally pleased to see your outline plans and ideas . . . . however basic they may be! 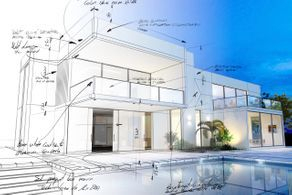 We will always do our best to provide an initial outline guide price for your prefabricated home project, when sufficient detail and specifications have been provided. Please however, do not expect a guide quotation to just: "We want a 3 bedroom, 2 bathroom prefab house". We can also produce stunning 2D and 3D floor plans and visualisations, bringing your ideas to life, which for many provides an easier to understand and better appreciation of their intended dream. This can be one we have suggested or recommended, or even our own in-house team. Or your own locally selected one. (Some countries, e.g. Spain, require one locally registered . . . even for an existing design. 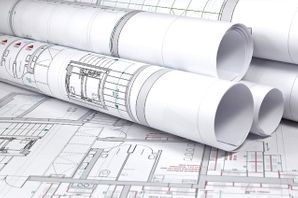 Your appointed local architect does NOT need to have knowledge of our construction methods. He or she can simply produce what are called .dwg files (AutoCAD's) for the construction of your prefabricated house project, just as they have always done. We will make the relevant transpositions required for steel-frame prefabricated construction. Until recently, prefabricated houses have been predominantly available and used towards the more northern part of Europe, (and even then, frequently only in limited 'stock designs') in such countries as France, Norway, Sweden, Great Britain, Germany and Switzerland, to name just a few. Accordingly, local style and climate has been a common factor in their choice of sustainable house design and prefab homes. They have invariably been restricted design, timber-frame structures. Or restricted by 'module' sizes. With our varied certifications including for example, ISO 2001:2001, EN1090-1 and code TEK10 for Norway, and ability to address all climatic conditions, our modular homes and buildings really are suitable for use globally, and designed for the specific local conditions. Prefab homes have also previously been associated with low budget, low quality and even 'temporary housing', and accordingly have had a somewhat 'poor and questionable' reputation. But now, it's . . . . . Sophistication and Flexibility. Prefab Houses. This really is the future of the building industry. Contemporary Design and Technology has changed everything. In addition to the more traditional styles previously associated with prefabricated houses, we are frequently addressing the rapidly growing demand for contemporary and modern design homes and buildings as well. . . . . . . Your first step to your new home. The manufacture of a BESPOKE DESIGN house, is no more expensive than an 'existing' design. 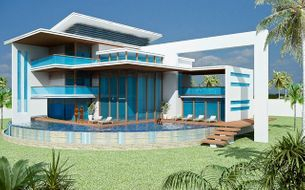 Your house, villa, resort, or property development need have no restriction in terms of style, size, height or design. (Other than any local planning regulations.) We are not restricted by 'modular' sizes for example. No-one ever wants exactly the same. Individual and personal requirements always vary. Plots are never the same either. - Maximise all the advantages. 'Enjoy the experience' and start your eco development or dream prefab home from scratch. It is after all, not every day that you have the opportunity to design the individual home or project of your dreams. - Time to start that bespoke design . . . . The hi-caliber insulation in ALL our prefabricated panellised sections, works both ways. With virtually limitless sustainable design possibilities utilising the latest prefabricated home building and house construction techniques, you really can let your imagination run free . . . . . Inside and out! 'Plain and traditional' only? - No way! kit houses or whatever you wish to call them, doesn't mean restricted and boring! However restricted local planning may be! Prefabricated Houses in Portugal, Eco Friendly Villas in Mallorca, Contemporary villas on Mallorca, Steel-frame Prefabricated houses in Mallorca, Prefabricated Homes in Marbella, Casas ecológicas en Andalucia, Kit de Casa en Catalunya, Prefabricated villas for Cyprus, in fact Prefabricated Buildings in Eastern Europe, in all Mediterranean surrounding locations, the Caribbean, Latin America, and beyond . . . . .